Good article in the News Hopper about the stabbing yesterday. Can’t be easy being a head teacher in London. Here’s a wonderful thing. 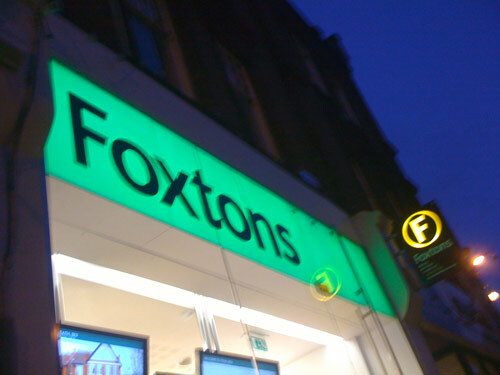 Above is a photo of Foxtons in Blackheath. Does that look like “non-illuminated fascia” to you? No, didn’t think so. Which is interesting, as their planning consent clearly states that their signage doesn’t light up. respect of the installation of non illuminated fascia and projecting sign. It also states that they must not open on Sundays. 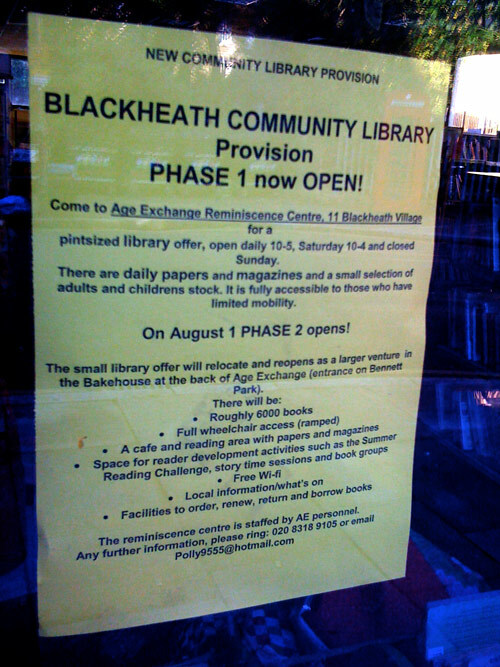 And yet every Sunday, there they openly selling overpriced flats to the good residents of Blackheath. Because council planning rules don’t apply to people who can afford to flaunt them. They’ve currently got a planning request in with the council to adjust the opening hours to include Sundays. I’m sure it will be approved. Maybe they could put a children’s library in the basement at the same time? The council should either enforce planning rules or just not bother and go home. I’m sure there are other useful services they could spend the money on. (thanks to 853blog for the tip-off). 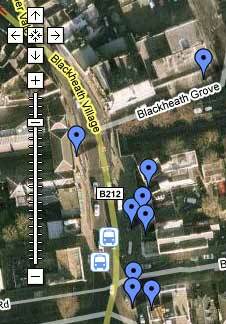 Stabbing up in Blackheath Standard, and a car crash opposite the butchers in Blackheath village. Nasty business. As Mrs Bugle once owned a budgie called Charlie, I feel duty bound to inform you of the sad little message pinned to a lamp post near the Thai restaurant. 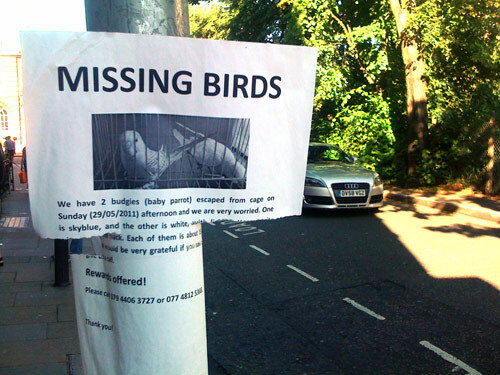 If anyone has seen two budgies, please call 07944063727. Equally as depressing, the “pint sized library offer” currently available at the Age Exchange, open monday-friday 10-5, saturday 10-4, closed on Sunday. Phase 2 opens on August 1st. Incidentally, can anyone explain to me why it would be a good idea to permanently close the side exit from Blackheath station by barricading it with a bannister? Tired commuters on their way home used to love gasping out into the open air. No more. If it’s as much fun as the last one I attended, it should be fabulous. 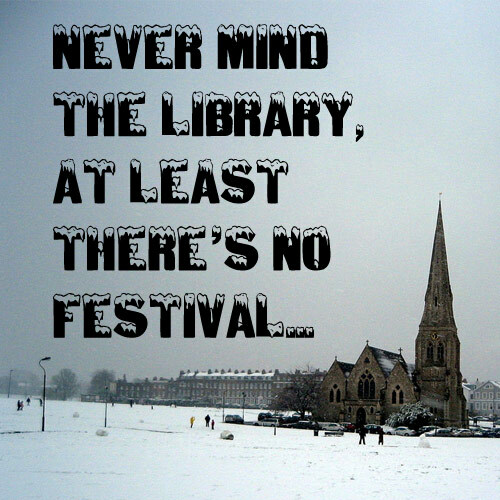 Which reminds me – Blackheath Society are asking for Christmas card designs. Mine’s below. Based on this photo from Flickr. PS: Sorry for the lack of posts currently. New flat and new job don’t make for easy blogging. It will pick up soon hopefully. Please send me stuff if you think I’m missing things!